Highly transparent and perfect for glazing in oils and watercolors. This bright yellow is reminiscent of the original Indian Yellow and is suitable for all media and is lime/plaster and concrete proof. Q: Is there any way to make the mayan pigments more opaque in oil paints? Like any fillers or additives that would take away most transparency while not severely tinting the hue? A: Marble dust acts will make the Mayan Pigments more opaque in any medium. Q: What plant is this mayan yellow dyed with? Is there really nothing synthetic in it? Thank you! A: The manufacturer simply lists the dye portion of the pigment as a "proprietary ingredient", but qualifies that statement, by stating that all ingredients are natural. 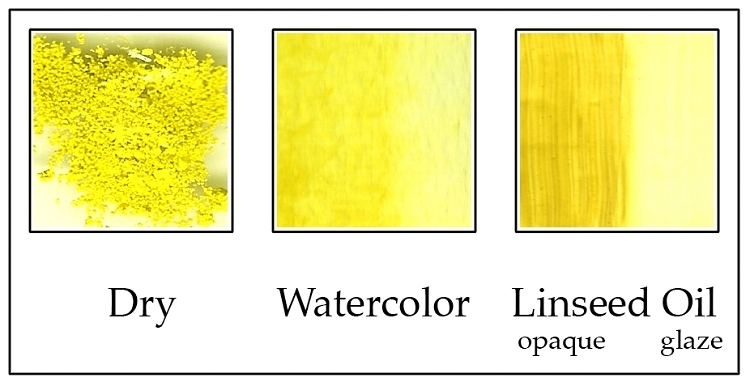 Q: What is the color index? Is this color lightfast? A: Since this is a natural pigment, exact color mapping information is not available, but is in the range of PY15. The color is lightfast. Q: Is this a cool yellow? I’d mix it in a pail linseed with nothing else. Also, about how much oil would you need to make workable paste out of 100g of pigment? A: Yes, it is probably the coolest yellow we have, tending towards greenish. 100g would probably require around 3-4oz. of linseed oil, in order to make it into a paste.